★ Closure : Hook and eye. ★ Fabric: Soft Faux-Fur. Lining: Ivory Silk Satin. 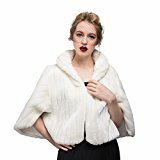 ★ Occasions: This cute faux mink fur shrug is the perfect coverage option for your winter wedding and any other Special Occasions. New Fashional luxury Faux Fur Mink Shawl .The available Colors is Ivory. This is faux fur winter shawl perfect for casual, shows and ladies evening prom party any other formal occasion. It’s nice and thick to keep warm as well as elegant during a winter event. You get the Luxuries style from this beautiful Mink fur without sacrificing the life of our animal.